The DASAC show this weekend centered on the theme of “Old School vs. New School“ and also stirred up a commentary on different types of confidence. 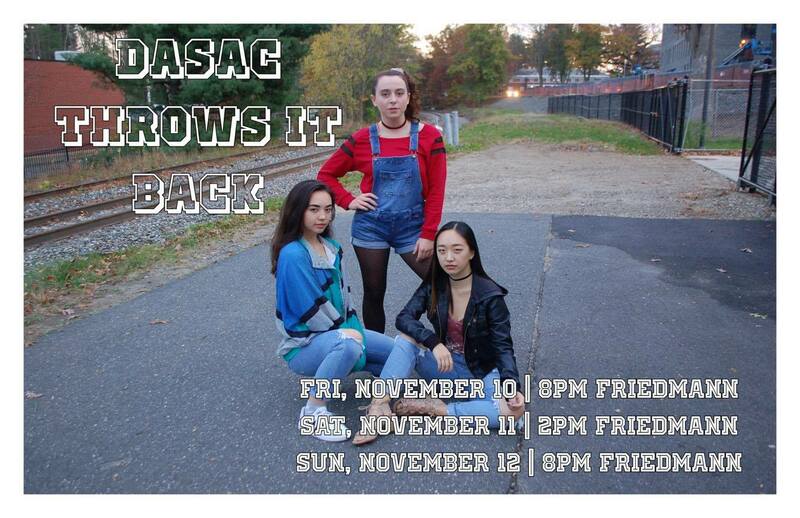 Dance and Step at Amherst College (DASAC) hosted its fall show this past weekend, and in it, the group once again exemplified how to combine style, agility and audience engagement in a performance piece. The theme for this show was “Old School vs. New School”, but after a few minutes watching the show, it became clear to me that this was really a show about two schools of confidence. There is the cocky, big-headed kind of confidence that constitutes the old school. Then there’s the fierce, elegant confidence, full of poise and charisma, the kind that we all have wished for at some point but few have actually attained— this represents the new school. Although the show dramatizes the juxtaposition of these two schools of confidence, making them out to be in conflict with each other, the two forms come together to create a dynamic balance between corny charm and unapologetic fierceness. As Anise Diaz ’18, co-director of DASAC, notes before every DASAC performance, the audience is also a part of the show. The show would not be as exciting without the enthusiastic support of the audience, as is true with any engaging performance piece. DASAC has always been specific about what its art celebrates — the dance styles of the African diaspora — but this show was perhaps the strongest example of the group showcasing the urban politics these dances have their roots in. The show was filled with colorful pants, baseball caps, jackets and every other style of dress that one might find in a 1990’s or 2000’s R&B music video. And when I watched those music videos — made by Chris Brown, Soulja Boy and Usher — as a kid, I always danced along and the rest of my sisters would too, young as they were. In essence, many of the segments in this piece felt like parts of a really enjoyable, nostalgic 2000’s music video, only the energetic camerawork was replaced by lighting and the thrill of seeing friends and classmates. This show exhibited more virtuoso athleticism than DASAC usually has, including many more back flips, splits and an impressive section where all the dancers on stage performed balancing moves with chairs. This greater emphasis on athleticism, along with the traditional “themed breakdance number,” inspired by Pokémon this fall, gave the show a much younger and more carefree vibe than previous DASAC shows. The participation of the audience was vital, because when the dancers were not competing with each other in dance battles, they were daring people to challenge their style, much like in a nostalgic music video. It was a return to a younger, cockier kind of confidence that made us laugh, and more importantly, remember a simpler time when confidence could also be silly. In other pieces, the dancers wore more traditionally “elegant” costumes and danced to more modern music, but I could clearly see the connection between the earlier era and the current era. One of the pieces that clearly showed the correlation between old and new confidence was “Wine Night,” choreographed by SJ Doi ’18. This piece, using music by SZA and Kelly Rowland among others, evoked the sensation of watching someone being coyly elegant, trying to impress their partner. The dancers were slow and sensual, and their slow movements gave off a chill and subtly adventurous vibe, just enough to impress the audience while still maintaining the feeling of a quiet internal confidence. While I would not necessarily call the connection between the two schools of confidence one of maturity, I would call it an evolution. Obviously, there are still people who exude the kind of confidence represented as old-school in this show, but I think that that old-school confidence provides the foundation for the confidence that protects us from the harsher aspects of our lives. We strive to develop a confidence that cannot be questioned, one that is intimidating, self-assured and magnetic: this confidence goes well with the age of social media, where we post the best versions of ourselves, photos of us literally glowing in pictures — a kind of confidence that most certainly cannot be undermined. Some of the dances that brought this new-school energy were “Now Watch the Queen Conquer” by Anise Diaz ’18 and “Yayo” by Matthew Holliday ’19. In fact, this dichotomy was best presented in the number “Old School vs. New School,” choreographed by Kameron Millner ’19. In this number, presented relatively early in the show, the moves and attitude of the 90’s and 2000’s face off against their 2017 counterparts. The come-ons and squeaky-clean charisma of the old-school juxtapose sharply with the mature, even-keeled charisma of the new-school. The piece ends with the two schools no longer battling but dancing together, and this made me realize the connection between the two aesthetics. We constantly try to balance our goofy, charming side while also trying to build up our toughness knowing that we’ll need it more often, especially in college and the real world. The show brings back these earlier, younger versions of confidence to remind us that corniness and seriousness don’t have to be mutually exclusive. The confidence that we get from dancing to a music video alone is simply the foundation for the confidence that we develop facing challenges in our identities or in our everyday lives. And that is a school for which class is always in session.